Ivy Compton-Burnett’s novel A Family and a Fortune, published in 1939, is the only one of her twenty novels that I have read so far, but from what I have gleaned from other reviews and articles about her, they are all mordantly witty, surgical explorations, written almost entirely in the form of elegantly expressed dialogue, of the painful vicissitudes of comfortably well-off country gentry at a late Victorian-early Edwardian period of English history. Hilary Mantel, for example, refers to each one as ‘a gavotte on needles’. The plot is complicated and eventful. It concerns the dramatic impact on the Gaveston family (and their circle) of a large inheritance; there are several deaths, a broken engagement, and various other twists and narrative turns. In ‘A conversation between Margaret Jourdain and ICB’ in the Turtle Point Press ‘Traveltainted’ online literary magazine here (MJ was ICB’s housemate-companion for much of her adult life; she died in 1951), Compton-Burnett cheerfully agrees that she has very little interest in ‘exposition and description’, and prefers to hear her characters’ voices. Authorial comments or free indirect discourse are sparse; much of the wickedly pleasurable experience of reading this novel derives from the brilliantly orchestrated, extended sequences of internecine warfare conducted through acerbically epigrammatic drawing-room or dining-room family conversations in the Gavestons’ large country house. Unfortunately for me, this makes it almost impossible to demonstrate the exquisite skill shown by the writer, for each speech depends on the whole context of the entire conversation, for each one is intricately woven into the whole sequence of discourse; to quote a short extract out of context would not do the longer sections justice. Often it is difficult to determine who is speaking to whom, for the characters tend to converse in fairly large family groups, without the author ascribing a name to the speaker, or making it clear which of the group they are addressing. This means one has to read closely and attentively, and often, I found, re-read – but it’s an effort that I recommend you make, for the dialogue has some of the wit of Wilde, the insight and wisdom of Austen, and the technical dexterity and psychological subtlety of Henry James – with a touch of the bleakness and darkness found in later masters of suggestive, elliptical dialogue such as Pinter and, weirdly, Beckett himself. What I can do is to quote a few sections in an attempt to illustrate some of the other rewarding aspects of what second son (of three) Mark Gaveston calls ‘our family drama’ (the Freudian note is apposite). 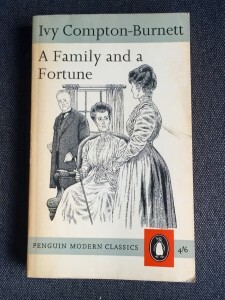 His late-middle-aged father, Edgar Gaveston, is married to Blanche, whose sister Matilda (Matty), two years her senior, comes to live, along with her elderly father, Oliver, and her much-put-upon companion, Miss Griffin, in the Lodge House on the Gaveston estate, having come down in the world and grudgingly sought charitable refuge. Far from showing gratitude for Blanche and her family’s generosity, Matty displays nothing but venomous selfishness and resentful self-pity for her straitened circumstances, and she verbally skewers each of the Gavestons remorselessly, while bullying the unfortunate Miss Griffin, and anyone else who has the misfortune to enter into her sight. The Gaveston family is completed by the presence with them for much of his adult life of Edgar’s kindly, slightly younger bachelor brother, Dudley, whose inheritance of a large fortune precipitates the action of the novel. This speech could hardly be simpler in structure or vocabulary, with its multiple paratactic ‘ands’ and ‘buts’, those colloquial largely monosyllabic expressions and the repeated discourse marker ‘well’. This shows how the author’s skill resides not just in the beautifully wrought, subtly nuanced prose conversations, but in her ability to reveal character indirectly like this in passages of realistically, apparently straightforwardly ingenuous, dialogue. But Matty’s bitter irony at the end of this speech is breathtaking. Whether she intends to reveal so much of her sordid nastiness, or realises she’s doing so, is part of the ambiguous effect. Did she even have such an experience, or is she just making up a story about another horse accident victim to highlight her own devious self-depiction as a worse sufferer, who persists in projecting a monstrously distorted image of herself as a martyr, a long-suffering saint? And Compton-Burnett herself acknowledges in the interview cited earlier that wrong-doing in a novel is more ‘spectacular’ and attracts more sympathy from a reader than virtue, and makes a ‘more definite picture or event’; the villain tends to ‘usurp the hero’s place’. Egocentric Matty seeks revenge on the whole world for what she perceives as the injustices life has meted out to her. ‘Riches are a test of character and I am exposed’, he says soon after, when Matty writes him an unctuously ambiguous note to thank him. He is one of the few characters to emerge with much dignity. All the others reveal more or less unflattering aspects of themselves as they respond to the fluctuations of their fortunes in the light of Dudley’s (and hence their own) changes of circumstance. Watching this process unfold is fascinating and often darkly, deliciously humorous. The dialogue distributes ambiguities, multi-faceted, hinted-at underlying meanings and innuendo, lurking insidiously below the apparently innocent surface remarks; these in turn often lead to discussion and metapragmatic debate as to what the speaker might really have meant, and how their words could or should be interpreted. It’s a heady mix. As always she wrings every last drop of self-pity out of a speech intended for once by Justine to be attentive to her aunt’s needs, and a dramatic situation in which her family – even the perennially exasperated Justine – are trying to be helpful. ‘Yes, I daresay, Aunt Matty [Justine replies]. I did not mean the word to be a barbed one. Oh, I think you probably did, Justine, and doesn’t Matty let you know it! This may not be a novel to rank with Austen or James, but it’s not far off, in my view. But I think for many it will be an acquired taste. I’d be interested to hear what others who’ve read it think. This entry was posted in English Literature and tagged A Family and a Fortune, Henry James, Ivy Compton-Burnett, Jane Austen by Simon Lavery. Bookmark the permalink.